The story of the Ross River tourist resort started when beach sand under a shallow sea was compressed into horizontal rock sheets. Monumental forces tilted them into an inclined position, forming the East MacDonnell Ranges, being further shaped by wind and rain. 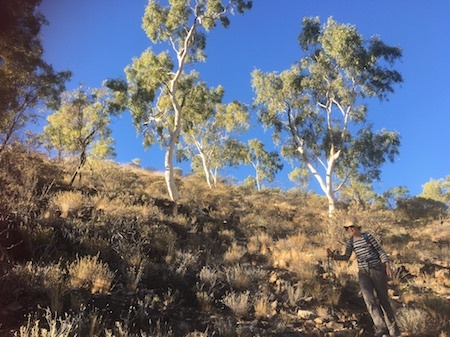 Eight hundred and fifty million years later the Arrernte people imbued the magnificent chain of mountains with a meaning: As the caterpillar ancestral beings moved out from Emily Gap, they formed the ranges and the site of Alice Springs. 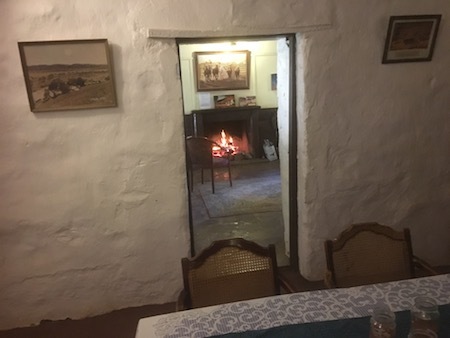 In 1957 the Green family laid the foundation for the resort with 30 chalets, some still in use today, and converted to a bar and dining room the old cattle station homestead, the historic and charming centrepiece of the complex. 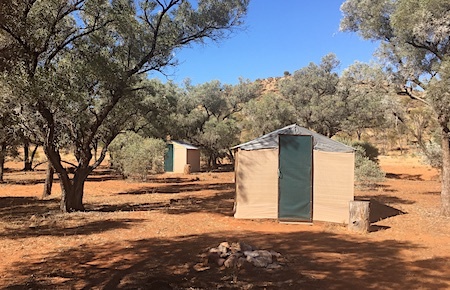 It was bought by Melbourne construction magnate Reno Grollo in 2001, a 6200 hectare excision from the 3670 square kilometre Loves Creek cattle station, now Aboriginal owned and leased to a non-indigenous pastoralist. Today Ross River has 33 powered caravan sites with 20 more under construction. It has 500 date palms in their third year towards their fruit-bearing age of six. 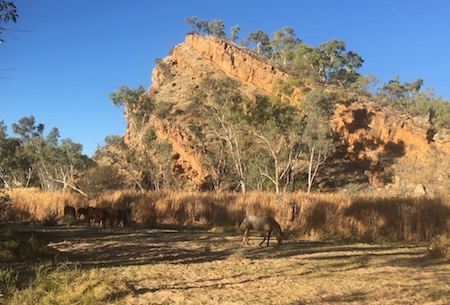 There are 80 wild horses reducing the bushfire risk by eating the fuel load (the couch and buffel grasses elsewhere rampant). The camping ground epitomises the relaxed atmosphere: no numbered rectangles here. You pull up where you like, taking your pick of the shade and views. The length of your extension cord is the only restriction – if you need power, that is. 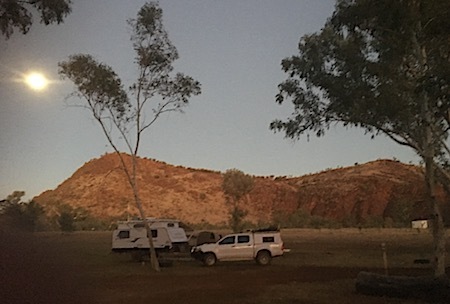 No wonder visitors who come for a night stay on: They share the valley with towering gumtrees, red craggy hills on which the sun sets, and a view across the river to more, their slanted rock sheets a reminder of eons ago. 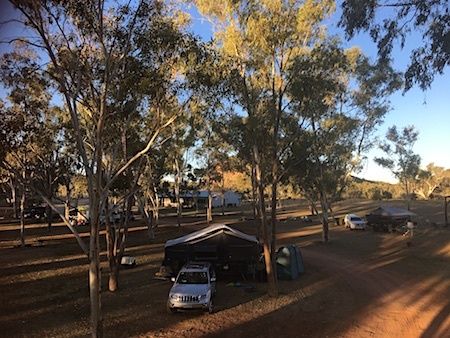 It’s also the venue for some of The Centre’s favourite events, Wide Open Space, Fish’s Run, Big Sing and bush bands who come to practice ahead of their festival in Alice. The new function centre is increasingly popular for weddings, birthday parties, school groups and training courses. For managers Lee Donald, a clinical nurse manager, and Graeme Adlam, a wool classer and exporter, it’s a bush change. They took over with little prior experience in commercial hospitality, yet having checked it out last October, signed up for five years. Some evenings they take their 4WD a couple of kilometres north to a hill overlooking the Sphinx and the Wall of China, have a glass of red and immerse themselves in the silence. “That’s where we solve the world’s problems,” says Mr Adlam. The more immediate problems are not overpowering. The Ross River, met upstream by the Trephina and the Benstead rivers, is usually dry, winding its way south through yet another picturesque valley. It is flanked by mountains that have gentle slopes to the south, covered with spinnifex and white gums. The northern flanks are rocky, red and steep. There is plenty of good quality groundwater. Electricity is generated in the resort’s own power station, burning more than 500 litres of diesel a day, which seems to invite an experiment with solar. 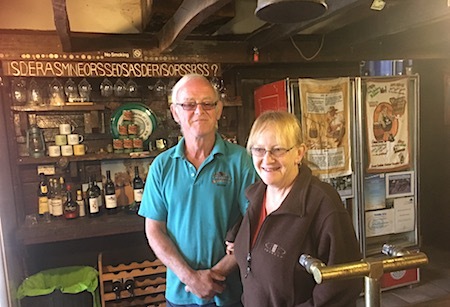 Ms Donald says promotion is mostly by word of mouth: Self-drivers heading north or south on the Stuart Highway take the 80 km side trip, like it, pop in again on their way back – and tell all their friends. 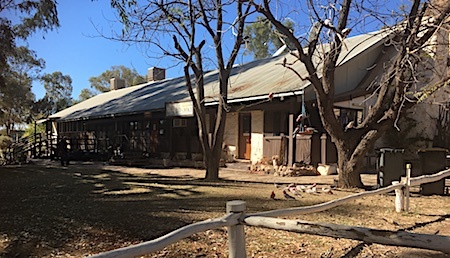 She says the Visitor’s Centre in Alice Springs has Ross River brochures available but the West MacDonnells are getting more active government promotion than the East Macs, and she asks, why? There are two or three other staff, mostly backpackers who come for three months. With the Arltunga pub and camping ground closed, Ross River is the gateway to the East Macs, mirroring Glen Helen some 300 kms to the west. With their down to earth atmosphere, and more than adequate facilities, they seem a perfect template for more wilderness resorts in our glorious MacDonnells. .. and the new. 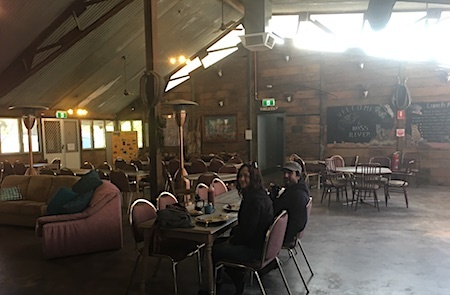 The dining room added in late 1990s and built from old Ghan sleepers and steel. The valleys and slopes around the resort are great for walking, and the shiny white gums are everywhere. The moon rising over the uncluttered campground. An outstation for star gazing; nights are spent in two-bed hut-like tents. Some of the original chalets are still in use. 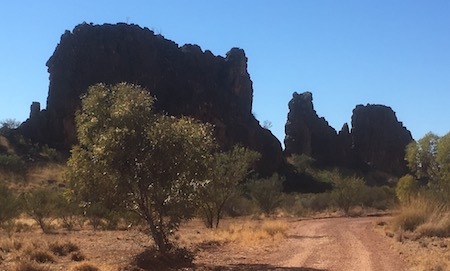 There is another access route, south down Ross River, via Ndala Gorge, and return via Ringwood Road to Alice Springs, requiring 4WD. Again the planning boffins had their ear muffs and dark glasses on when they designed the Outback Way. It would be so easy to direct much of the traffic that will enter from the east into Alice via Gem Tree, Hale River resort, Arltunga and Ross River, thus opening up a new tourism province to a new market. One of the drawbacks (minor) of Ross River is that you return via the same scenic route. Few people I speak with mention the circle via The Gardens road OR Gem tree. The same reasoning applies to freight traffic from Queensland to WA and to provide an alternative to congesting the Gap with road trains and directing them to an integrated road rail and air freight centre hub at Brewer via the East Macs and even to Santa Teresa providing commercial possibilities there. This is so obvious but ignored. Time for a bit of very forward looking thinking and a new commercial centre near Brewer. But I just saw a pink camel fly over my back fence. Had an absolute ball working at Ross River back in the mid eighties with some fantastic Territorians and backpackers.